A new group has been established to get recent graduates actively involved with their alma mater in a meaningful way. “The Young Alumni Council was founded on the idea that young alumni truly care about their community and want to give back to FIU,” says Hiram Hernandez ’03, who came up with the idea. The new council, working with the Office of Alumni Relations, will direct programming that appeals to alumni 35 years and younger, which represents about 70,000 FIU graduates. Young Alumni Council founding members: back row, from left, Marcos Oyola ’11; Phillip Lloyd Hamilton ’12; Hiram Hernandez ’03; Mario Martinez ’12; Travis Stokes ’09, MPA ’12; Daniel Garcia ’10. MST ’12; Jose Bowles; front row, from left, Lourdes Dominguez ’13; Kimmie Schmidt ’09; Brenezza Garcia ’05, MS ’07; Manny Arce ’03; Thomas Pla ’03; Adrian Molina ’10; Angelique Freire ’11; Erika Galan ’11; Carolina Bayona ’11 JD ’14. Through activities and events, the council will promote career development, networking opportunities, leadership opportunities and philanthropy. Individuals serving on the council will also have the chance to learn about leadership through their connection with the university. They will be invited to support FIU’s fundraising efforts. “We volunteer our time because we are grateful for FIU and the doors graduating from FIU has opened for us,” Hernandez says. “We volunteer because we believe that giving back is the best way to receive. Currently 20 or so alumni are members of the council, but there is room for more. Interested alumni are invited to learn more at FIUalumni.com. “We look to fill the council with young alumni who care about FIU, are dedicated to serving others and do so in a manner that represents the success FIU has had in its young history,” Hernandez says. 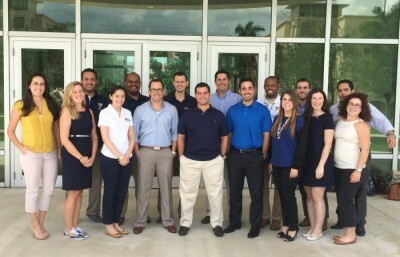 “We hope that the Young Alumni Council is the organization that represents FIU young alumni at large. Ultimately, Hernandez says, the group aims to showcase to the community the high-quality, caring, civic-minded professionals that FIU produces. “Those individual qualities become yet another reason for young students and established alumni to want to come to FIU and continue the learning and growing process,” he says.